The 19th Conference of Parties (COP) on climate change began in Warsaw’s imposing National Stadium on an emotional note: on the first day of the talks Yeb Sano, lead negotiator of the Philippines, made an impassioned speech about the typhoon Haiyan that had wreaked havoc in his country. Negotiators observed silence and some delegates joined their Filipino counterpart in shedding tears. That done, it was business as usual. As negotiations progressed it became clear that developed countries would win hands down. The key expectations from the Warsaw climate talks were three fold. 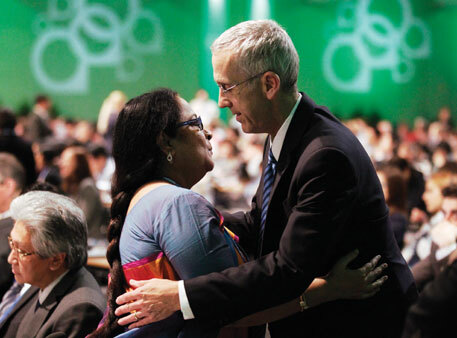 One, prepare for a global agreement by 2015 on efforts to keep temperature rise below 2°C and a draft negotiating text to that effect; two, institute a mechanism on loss and damage as agreed to in the 2012 climate talks in Doha; and three, gain clarity on climate finance to be given by developed countries. But developing countries lost on all fronts. 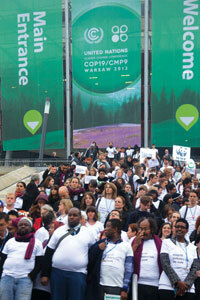 The climate talks are held under the aegis of the United Nations Framework Convention on Climate Change (UNFCCC). Its premise is differentiation between developed and developing countries. Under the principles of the Convention, developed countries are tasked with assisting developing countries with finance and technology so that they can grow in a manner that is sustainable. In 2011, countries had agreed at the Durban climate talks that this would remain the premise of the new deal, which is to be drawn up in 2015 and implemented by 2020. The Ad hoc Working group on Durban Platform for Enhanced Action (ADP), a working group under UNFCCC, has the responsibility of drawing up this deal, popularly known as the post-2020 deal. It was agreed that the new deal, “protocol, another legal instrument or outcome with legal force”, would be applicable to all parties under UNFCCC. But the difference in the interpretation of “applicable to all” among developed and developing countries is the root of the problem. Developing countries say applicability should adhere to the differentiation principle of the Convention, whereas developed countries say that differentiation is a thing of the past and that all countries should come on board and take commitments. Developing countries wanted the word “actions” in the text, with reference to what all countries should submit towards the 2015 deal. Developed countries wanted to use the word “commitments” for all parties. This also brings out the difference in the interpretation of the developed and developing countries about the principle of differentiation. China, on behalf of BASIC (Brazil, South Africa, India, China) group, argued that there was no point in repeating old fights. Developing countries should enhance actions, while commitments should apply to developed countries, China said. 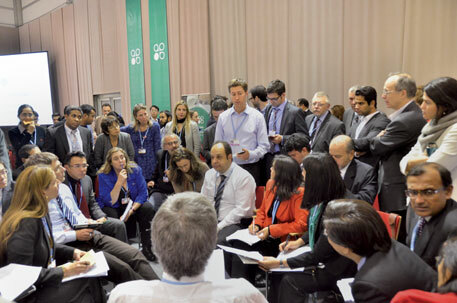 The country reminded the delegates of the compromise they had struck during the Doha climate talks in 2012. Parties had agreed on the words “enhanced actions” instead of “commitments” or “actions”. The US said it was astonished to hear China’s views that commitments are for the developed countries and said it was in the “Bali time warp”. Bali climate talks in 2007 had upheld the differentiation between developed and developing countries. US chief negotiator Todd Stern told the floor that ADP was different from the Bali Action Plan because of the words “applicable to all”. He said that China’s response indicated that it would not assume new commitments in the 2015 agreement. The European Union (EU), too, said that China’s proposal “would not fly”. The EU was of the view that the principle of common but differentiated responsibility and respective capability (CBDR-RC) would continue to apply, but the 2015 agreement had to take into account new and evolving realities. A binary approach—of developed and developing countries—was non-negotiable and unfair. The gulf grew to the extent that there were five different versions of the text. A sixth version was amended and adopted on November 23. Negotiations continued with the negotiators hardly getting any sleep since the second week of talks, which started on November 18. Jokes were abound in the corridors referring to each ADP draft as the latest version of I-phone model. But developing countries had little to cheer about the adopted decision. Parties eventually settled on the word “contributions” and agreed that they would submit nationally determined “contributions” towards the 2015 deal. These could be targets for emissions reduction, but also other efforts to keep their emissions down. CBDR did not find mention here. These contributions of developed and developing countries were made comparable and, thus, the differentiation between them diluted. To add to the injury, developed countries reneged on their commitments on other issues such as finance and loss and damage. A work programme on REDD, though, was drawn up (see ‘REDD+: will market call the shots?’). Redd+: Will market call the shots? A work programme on how payments can be made to those who preserve carbon stored in trees and other elements of the forest ecosystem—called Warsaw Framework for REDD+ (reducing emissions from deforestation and degradation of forests in developing countries)—was adopted at Warsaw. The programme promises finance for projects that can show they avoided deforestation, and thereby reduce carbon emissions. Besides deciding how emissions will be measured and how their baselines will be set, the Warsaw Framework also agreed that payment for such projects would be result based. It is a funding approach where payments are only made after specified outcomes can be proven to have taken place and the source of the fund could be bilateral, multilateral, private and alternative such as the Green Climate Fund. The results-based approach will include both carbon and non-carbon benefits, such as biodiversity and its protection, and benefit to the local community. But concerns are being raised that the results based aspect will be converted into carbon trading mechanism. For protection of forests, billions of dollars would be required. So much money may not be possible through public sources. So the carbon benefit aspect in the results-based approach will be used to develop a trading mechanism. BioCarbon Fund, a public-private programme within the World Bank that mobilises finance for activities that conserve carbon emissions in forest and agricultural systems, is one of the funds that will manage the initiative. The UK, US and Norway have made an initial payment of US $280 million to the BioCarbon Fund. The institutions created to focus on finance remain an empty shell. The money offered to developing countries is meagre. Wording on financial support in the final text of ADP is ambiguous. It “requests” as well as “urges” developed countries to provide support. The fact remains that developed countries are mandated to provide financial support to the developing countries under UNFCCC. This does not get reflected in the final text. The Green Climate Fund has little money in it. Developed countries’ promise of delivering US $100 billion per year by 2020 remains unfulfilled. No timeline was agreed to at Warsaw on how developed countries would achieve this target except urging developed countries to maintain continuity in mobilising public climate finance. The call from developing countries to ensure that this continuity was actually realised in the form of $70 billion by 2016 was ignored. Instead, a trivial sum of $100 million for the Adaptation Fund, created in 2001, was all that the developed countries could pledge at Warsaw. As agreed at the Doha climate talks in 2012, an international mechanism on loss and damage has been set up. But this has been instituted under the Adaptation Framework, which deals with how communities would adapt to climate change. Hosting it under the Adaptation Framework fails to establish the clear signal that loss and damage is beyond adaptation. There is little clarity on the scope of this mechanism. It is also not clear where the money will come from for the establishment that is now being called the Warsaw International Mechanism. Early in the Warsaw talks, it had become clear that developed countries would not allow any reference to compensation and liability in the agreement. They would also not accept attributing historical responsibility to the rich countries for the impacts being faced by the poorer sections of the world. It was clear that the fight on equity would be tough, especially for India, one of its strongest advocates. In the last 20 years of climate negotiations, India has steadfastly promoted the concept of equity and CBDR. 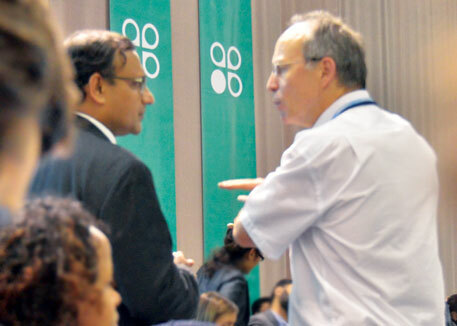 In Durban in 2011, it was due to India that equity was brought back as an important principle in climate negotiations. But in Warsaw, India was unable to defend its position. In fact, in many quarters it was seen as being anti-equity. This was largely because India opposed a process to make equity and CBDR operational. At COP-19, there was talk about the possibility of a number of indicators being used to define equity. Swaziland, for instance, on behalf of the African group, proposed an equity reference framework, with indicators such as capability and development need to decide what each country will do. But India refused to even allow mention of equity reference framework. For India, historical responsibility is the only indicator of equity. In the early days of COP-19, Brazil proposed that the Intergovernmental Panel on Climate Change, a UN body, study the historical responsibility of countries and on the basis of that, future emission reduction targets could be set for countries. But developed countries outrightly shot down this proposal. India tried to clarify its stand. “We championed equity. I don’t need the press, the NGOs, or anyone else to give me a certificate on my stand on equity. In Durban when we were fighting for equity, where were all of you?” an Indian negotiator asked other countries during an ADP session. But India’s explanation did not go a long way in clearing the air (see ‘Equity fight in the open’). Such positions have made India appear defensive at climate talks. To reverse this, the country will have to go back to the drawing board and reassess how it wants to play a strong role in these talks. ON the last day of Warsaw climate talks, the European Union (EU) climate commissioner Connie Hedegaard, while addressing the media, accused the group of Like-Minded Developing Countries (LMDC), including India, of being against equity. Venezuela, on behalf of LMDC, reacted sharply to the allegation.